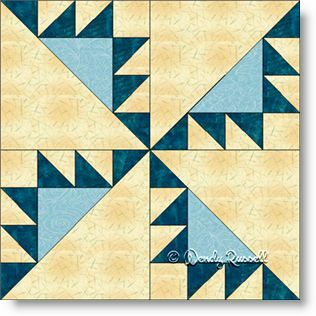 This quilt block called Kanzas Troubles is a little trickier than many blocks that contain only squares and half square triangle patches. That is only due to the method of construction. Some of the half square triangles are used on their own, rather than making two pieces into a square. That's not too difficult and by checking the placement of the pieces, this four patch block goes together quickly. In one of the quilt samples illustrated, you will note that I flipped the arrangement of the patches so that the pinwheel shapes were pointing in the opposite direction. This was done only to achieve the effect I wanted. Experimenting with placement of the large patches will give you the same effect. The creation process for the resultant quilt is half the fun!